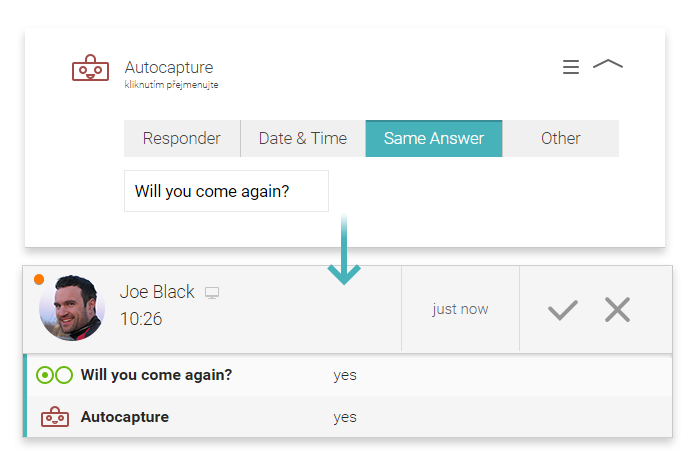 Save time with unnecessary data entry with our new friend called AutoCapture! AutoCapture collects data that does not need to be entered manually. For example, you don’t need to ask your responder for their name since you already know his or her name within the system, but you would prefer to have it mentioned somewhere in the response. So to avoid unnecessary data entry for the field respondent, the field is hidden from the user and is filled automatically depending on the AutoCapture settings. Responder name - Sometimes handy for adding the responders information into the exports. Dates and times - This denotes a timestamp that can be tracked in different ways, for example when the user really answered the response, or when the response was sent to the server (this may differ when working online or offline). Bear in mind that all times outside Modified to Web account completely rely on the mobile device time and might not be exact. Modified to Web account - When the response was completely received to the web account. If the response was updated within the web account, then it’s the date & time of the modification. Same Answer - For example, If you want to ask the responders name at the beginning of the interview, but you want to repeat this at the last summary page for report purposes as well. Other - When you want to generate a unique number for each of your responses, you can use the option Unique ID v2. So to summarise AutoCapture is a hidden field that collects information without the users involvement and adds them into your reports automatically.